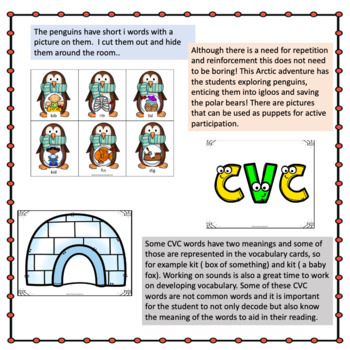 Short i, game, word families, phonological awareness, CVC words. Get ready for an Arctic adventure! 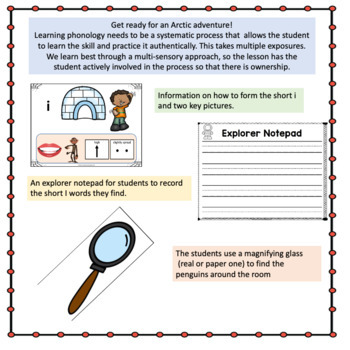 Learning phonology needs to be a systematic process that allows the student to learn the skill and practice it authentically. This takes multiple exposures. We learn best through a multi-sensory approach so the lesson has the student actively involved in the process so that there is ownership. Although there is a need for repetition and reinforcement this does not need to be boring! 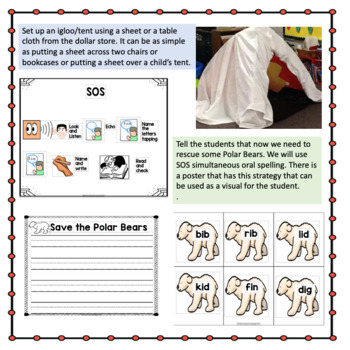 This Arctic adventure has the students exploring penguins, enticing them into igloos and saving the polar bears! 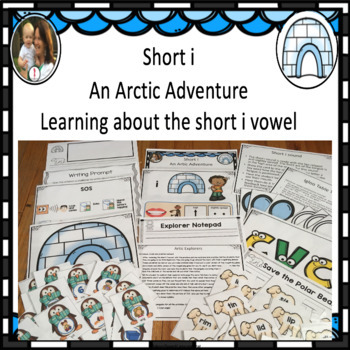 •Learn how the short i is formed. •Discover what makes the short i sound short.